1982: Hello, I Must Be Going! The first track from Genesis’ A Trick of the Tail, this was Collins's first appearance as the group's lead singer. A progressive rock track, it contrasts with the style of his later work. The ambiguous lyrics of Collins's first solo hit, "In the Air Tonight", have spawned an urban legend about Collins’ witnessing a murder. 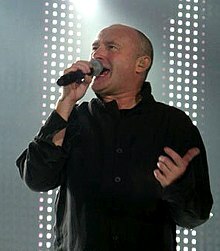 The dance pop of No Jacket Required, including this number one hit, won Collins a Grammy Award for "Album of the Year". The last of Collins's seven American number one singles, "Another Day in Paradise", was a topical song that discussed the plight of the homeless, and won Collins a Grammy Award for "Record of the Year". หน้านี้แก้ไขล่าสุดเมื่อวันที่ 7 มกราคม 2561 เวลา 01:05 น.